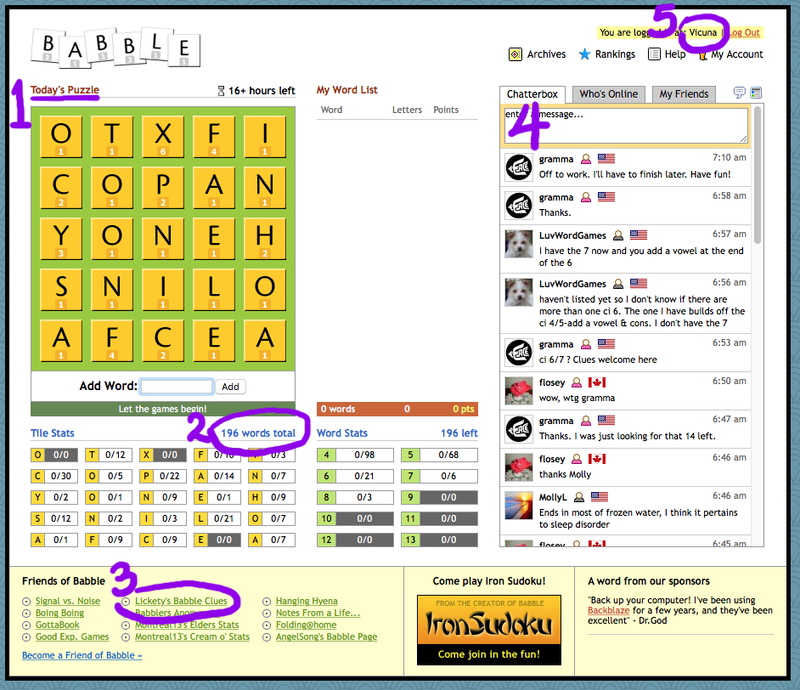 So that’s the outline of the Babble game and I highly recommend it to all who enjoy word games, but I find that there are some interesting linguistic issues associated with it, too. First of all, it uses a rather outdated dictionary called Enable, which has some interesting (and irritating) quirks. For example, there are words that it simply doesn’t accept, from henge, to, ironically, internet. Its selection of foreign words is erratic. It accepts all kinds of world currencies, which are certainly unfamiliar words that players tend to complain about bitterly, but are perfectly legitimate because they are, after all, the words that speakers of English use when referring to currencies. But Enable also includes titles from a variety of languages, including senor, sieur, monsieur, and even Portuguese senhor and Dutch vrouw, which don’t seem at all English to me… while it rather pointedly does not accept herr, frau, or any German words. It accepts all manner of Scottish dialect words, but not, for example, Irish sidhe. This just goes to show that putting together a dictionary is not as straightforward as many people assume, and is very much a matter of decisions about what to include or not. The second interesting point about Babble is the linguistic discussions that sometimes crop up in the the chat log (4). The chat log is a special feature of the game, and the players give each other clues for difficult words, banter, share recipes, pour out their hearts to each other, offer endless sympathy and puns, and are, in short, a surprisingly close community. People frequently complain about the eccentricities of the Enable dictionary, but another interesting discussion that comes up with some frequency concerns the “bad words” that Enable accepts. These range from explicit slang and swear words to all manner of derogatory terms. In a grid that contains such words, players will often remark that they “shouldn’t be allowed.” The answer, of course, is that they are words. No matter how much we wish they weren’t or that no one would ever use them, as long as people use them, they remain part of the English language. So this comes down to the prescriptive vs descriptive dictionary debate. Should the dictionary include only the words that someone decides people should use, or all the words that people do, in fact, use? If we acted as if these words didn’t exist, would it help them go away? It’s interesting to me to see speakers engage in issues like this. A tendency that I find far less endearing - in fact, downright infuriating - is Babble players’ tendency to label words “stupid.” For some players, any time they ask for a clue for a word that they are not personally familiar with, they complain, “That’s a stupid word.” Usually these are perfectly good words, just used in specific fields or circumstances, and I always want to reply “It’s not the word that’s stupid; it’s you.” But I don’t. In all seriousness, I find it deeply disturbing that so many people (not all) automatically respond to the unfamiliar with dismissive insults instead of curiosity, rational thought, and a desire to learn. babblet - noun, a word that appears quite commonly in the Babble grid, but almost never in ordinary conversation. It’s a word that most of us know only because of Babble, such as anoa, naoi, and teiid. firewords - exclamation, a variant of fireworks, which means you’ve completed the grid and deserve celebration. Other variants include firebirds, fireflies, and fw. listless - adjective, it does not mean lacking energy or enthusiasm. Rather, it is finding all the words without ever using the “clue” list of first two letters of each word, and it probably indicates that you actually had excess energy and enthusiasm for the grid! To list is also used as a verb meaning to use the list. pull a peri - verb, to ask for a clue and then immediately find that word by yourself; named for Babbler Periwinkle, who is particularly prone to it. 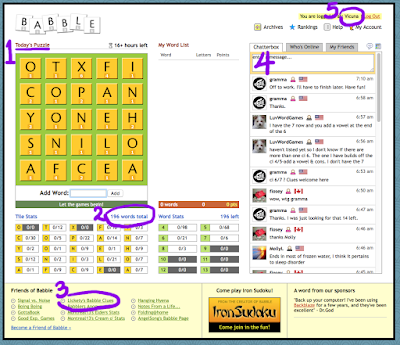 Here are a few more bits of Babble trivia: the largest grid on record included 744 words, while the shortest had only 10! (Most are in the 90-250 word range). 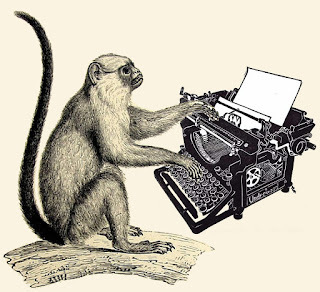 There’s never been a word longer than 13 letters, and the word that has appeared in more grids than any other, about 14%, is rete (a babblet for me). When I first discovered Babble, I was home with two preschoolers all day and the Babble chat community was my lifeline to the world, a precious opportunity to converse with adults even when I couldn’t leave the house. I still play most days, but in recent years I have chatted ever less and less, so that now I almost never comment, except very rarely to offer a clue if someone seems sufficiently desperate. But if you do join the Babble community, feel free to say hello. I’m Vicuna (5), known as Vi to my best Babble buddies back in the day. You will be welcomed! This week my children are taking their driver’s ed classes, so I thought I’d share my series of block prints of vintage cars. I’m not much of a fan of ordinary everyday cars on the roads, and I’d generally prefer not to drive if I can avoid it. Nevertheless, I’m certainly grateful for the ability to drive, for the luxury of owning a car, and for the flexibility and opportunities that driving gives me. In the past few years I’ve been in that chauffeur stage of life wherein much of my existence seems to revolve around taking children to and from their various activities which, between distance, timing, weather, equipment, and other logistical factors can be done by foot or bicycle far less often than I’d hoped. So, why does an artist with a less than rosy view of driving make a series of prints on cars? Because while I don’t like the cars around me on the road or taking up all the spaces in the parking lot, I have always liked antique cars. 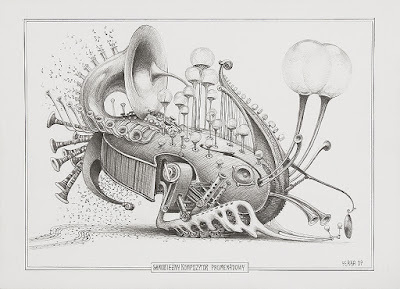 I’m not sure I can entirely explain why, but I think many of them are beautiful, and, (as is the case with the steampunk aesthetic), they simultaneously show off their practical workings and are crafted with an eye for art. They're also interesting symbols of their historical eras. I’ve enjoyed them since I was young, so I wanted to do a series celebrating that very early era of the automobile. 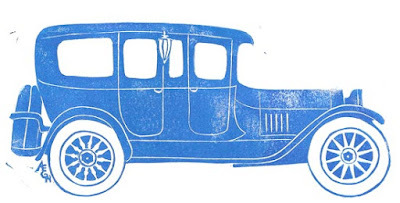 My organizing principle was to choose a car from each decade from the 1890s through the 1930s. (After that my enthusiasm wanes, and from the 1960s on I stop caring completely.) As a Cleveland girl, I began with the Winton Motor Carriage Company, pioneers in American car manufacturing. 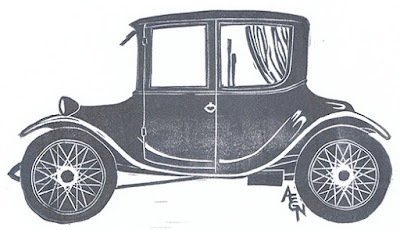 I’ve posted the 1898 Winton Phaeton in this blog elsewhere, so we’ll move straight on to the Ford Model T Touring from 1908, the first year that Ford began manufacturing cars by production line. 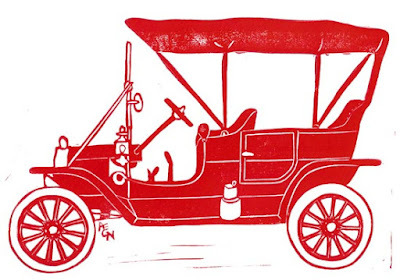 This is red because that’s what color the Touring style was; it was not until 1914 that all Model T’s were black. The Model T’s were of course famous for making cars affordable for the working classes, but that doesn’t mean the super-wealthy would be content with a car like that. My 1914 Locomobile print is a Model 38 Berline, of which only one still remains. It has no expense spared, including Tiffany lamps. It’s also huge. I complain bitterly about today’s SUVs, but this was much, much worse! For the 1920s I confess that what I initially wanted was a 1927 Daimler Double-Six as favored by Lord Peter Wimsey. However, after long searching I never could find any photographs of the right model, so I eventually decided to represent another interesting facet of the early automobile industry instead. The Milburn Light Electric was a popular car, especially marketed for women as being cleaner, quieter, and easier to use than a gasoline car. Note that the driver sits in the back seat of this Winton model, with curtains at the windows! My 1922 car, sadly, is one of the last of the electric cars for almost a century. I’m thrilled that electric cars are finally coming back, far better than before. And perhaps when self-driving cars take over the roads, the “drivers” will once again sit in the back seat with curtains at the windows. And finally, the 1935 Auburn 851 Speedster. Another luxury car, this was not only a thing of beauty, but included in every vehicle was a plaque certifying that it had been driven at 100mph. Its timing, however, was abysmal. No amount of power or beauty could compensate for the fact that the speedster was just too expensive for buyers during the Great Depression. So there’s my paean to cars as my children take their first steps towards mastering these metal monsters. Like any parent I’ll be terrified for them as they begin driving, but I’m also excited about a new world opening up for them. 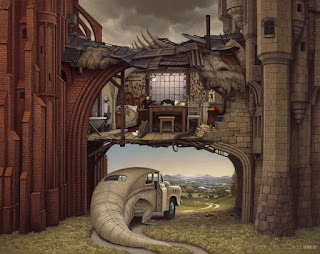 Jacek Yerka (Poland, b. 1952) is an artist who paints all kinds of cool fantasy/sci fi landscapes and creatures. With a strong vibe of René Magritte, many of his landscapes include surreal elements of transformation, dislocation, reversal, and juxtaposition. Some seem to include commentary on modern life, though many also seem to be simply imagination at play. certainly a head so very far away from the mainland should definitely have its own lighthouse. Interesting details include the arches down the dinosaur’s tail, and all the little windows in the world of the ocean floor. alive. 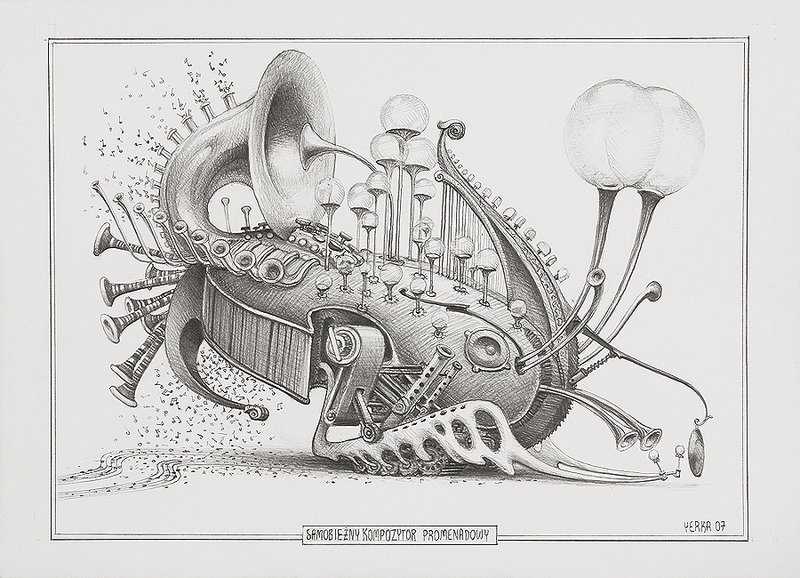 This is a common theme with many of Yerka’s creatures: they are hybrids of biological elements and retro machinery. This one seems to create a sort of musical dust. A nice touch is that the tracks of the treads are staves, upon which the falling notes write music. I imagine that the crocodilian-car creature might almost be a sort of tsukumogami, since the car looks so old and abandoned. Perhaps old cars left long enough grow legs and tails and become animate. 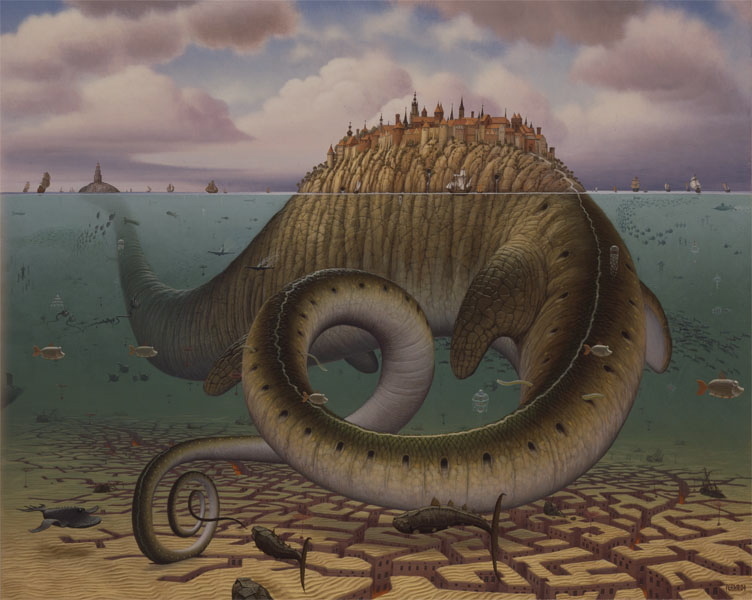 This particular creature must be a favorite of Yerka, since a very similar one appears in another painting, too. And finally, another wonderful town placed in a fantastical location. Is that lava over which the city clings, or striated rock, or something else altogether: winding skeins of thought or imagination, perhaps. 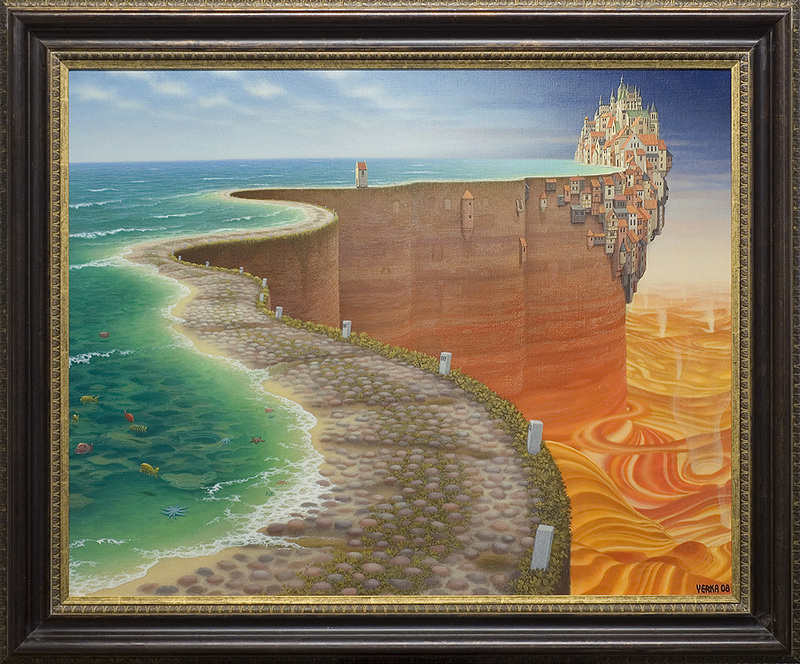 The markers along the edge of the cliff imply that the cobbled land between sea and cliff’s edge makes a road to and from somewhere else, so the inhabitants are not as wholly isolated as they at first appear. Yerka’s images are definitely an encouragement to imagination. Where is this? What’s happening here? What might happen next? Who, what, when, where, why? What if…? 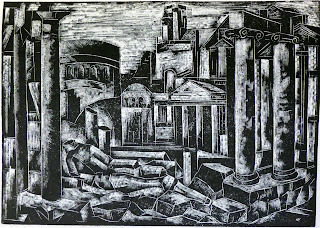 The final section in Norman R. Eppink’s monumental 101 Prints: The History and Techniques of Printmaking is Children’s Processes. This may possibly have been an afterthought in his mind, but I have to give him enormous credit for including it at all, as most Serious Artists hardly seem to consider that children’s art is art at all — or that adults using “Children’s Processes” are making real art, either. 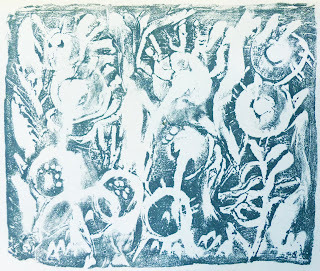 clay print, but I’m not sure he makes full use of the most interesting aspect of a clay block, which in my opinion would be the ability to press all kinds of shapes and textures into it, rather than just drawing lines. The foil print is interesting because it looks to be printed intaglio, and I’d be curious how classroom-friendly that actually is. Does he use ordinary aluminum foil, or does the technique require something a little sturdier? 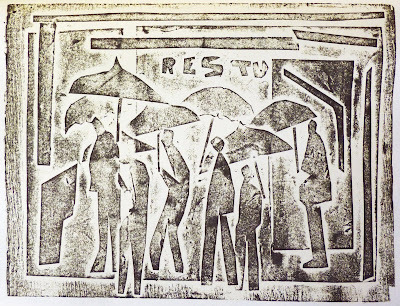 Do you need a real press as for other intaglio techniques, or can this be done with hand pressing or a mini press? Perhaps most interesting are the processes that Eppink includes for both adults and children. 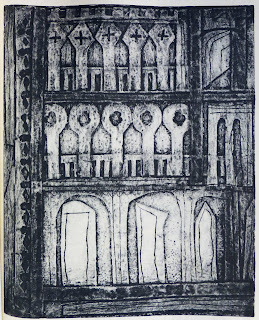 His collagraph is considered an adult technique, but “paper print,” which is simply a collagraph made with plain paper, is listed for children. 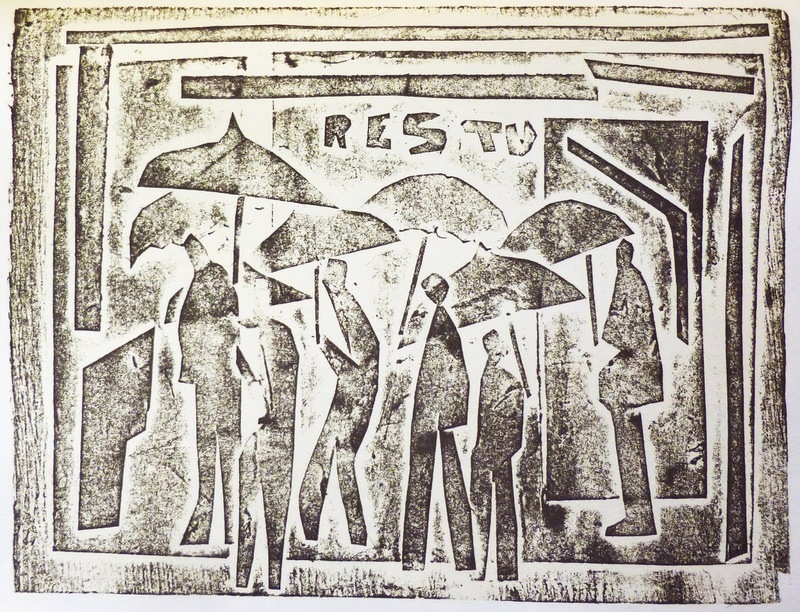 Eppink’s paper print (unlike his collagraph) is also printed relief, and I quite like it. I may do some experiments using paper, since I’ve always used board and thicker materials, but it looks like this would make it easier to get the inking even, not to mention easier cutting and gluing. 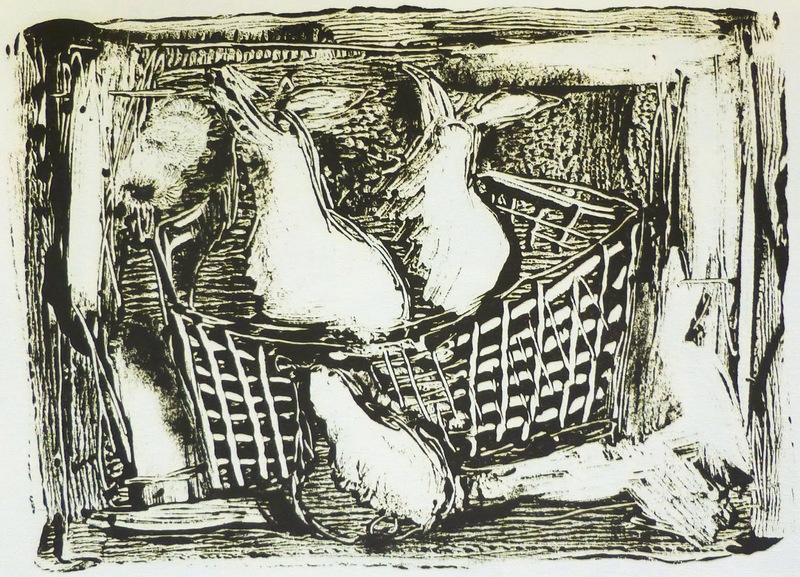 I can’t quite decide whether Eppink was contributing to stereotypes or helping to break them down by making a separate section of Children’s Processes, but I’m glad he included them rather than ignoring them, because they certainly add to the variety and richness of printmaking represented. (ink stays up on original surface) for comparison. 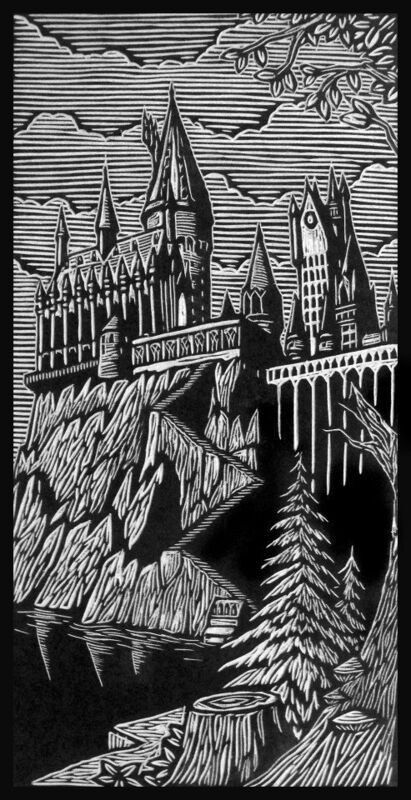 He also includes a relief printed version of his metal line engraving. 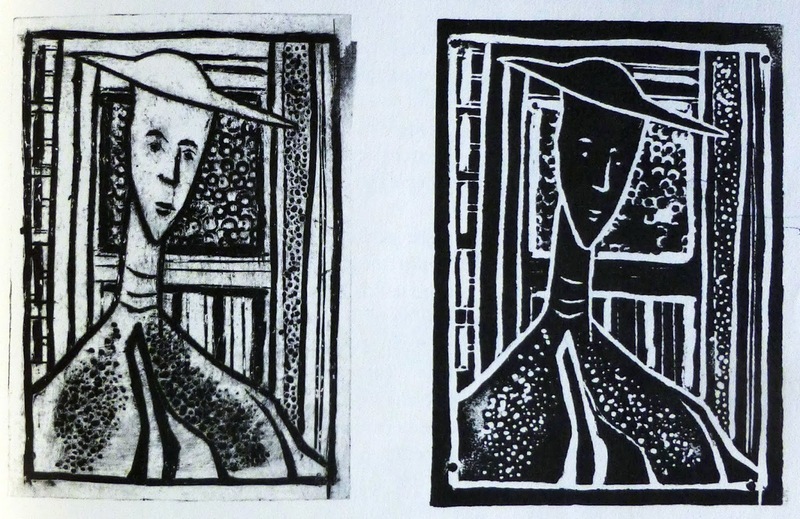 You can see in both of these how the intaglio print makes the more expected picture - black lines on a white background - while the relief printed version makes a sort of negative. 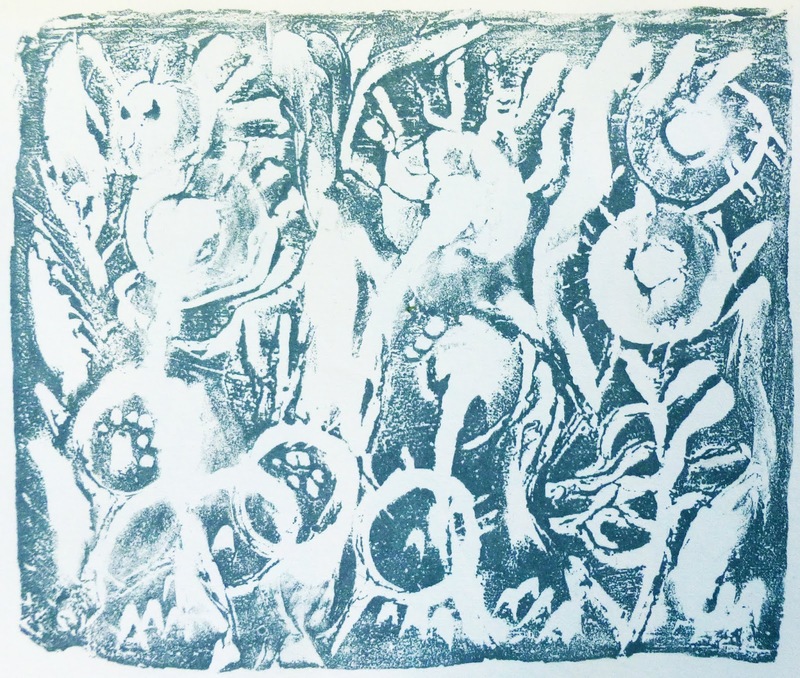 This is why intaglio took over from relief as the reproduction method of choice in printing. It is, after all, a lot easier to reproduce the look of a drawing that way. 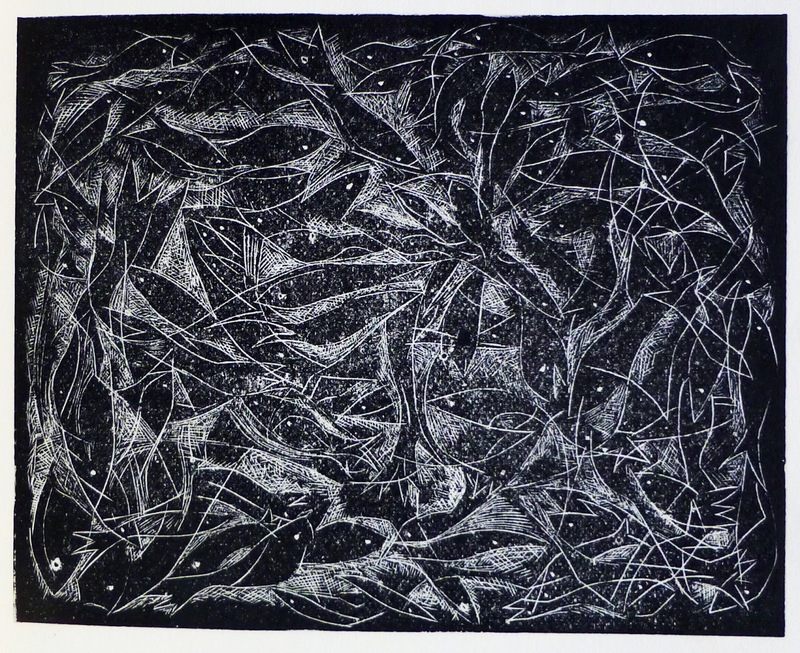 This is also why I prefer relief printmaking: it has its own unique look instead of being merely a method of reproducing another medium. 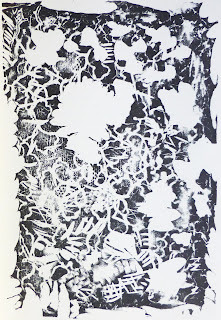 Along with his other metal plate techniques, Eppink includes a dotted metal print, a technique that has always been printed in relief. You can see my previous post about the technique here. 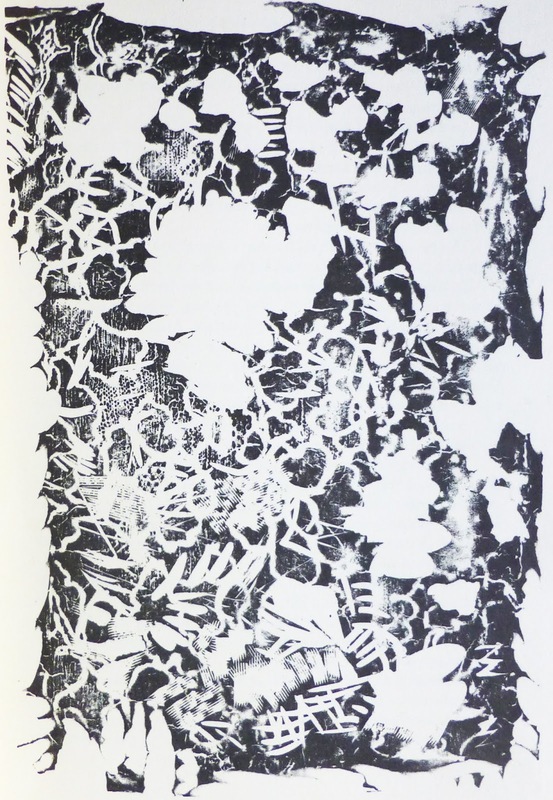 Why he put it where he did in his book, I don’t know, but I do like this one, with its interesting patterns and textures. 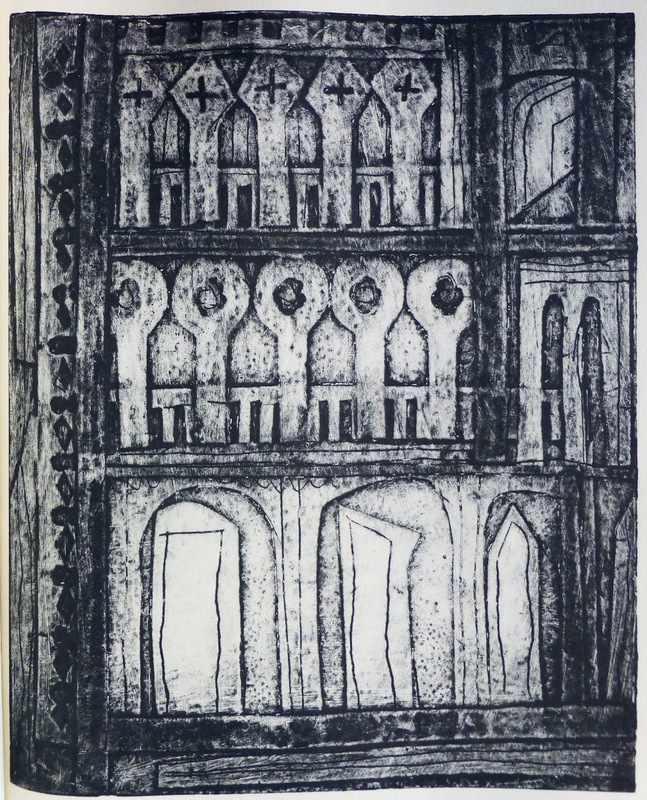 I’ve not yet figured out how to make or seal a collagraph so that it’s sturdy enough to withstand the wiping away of the surface ink that’s required for intaglio printing. Maybe someday! 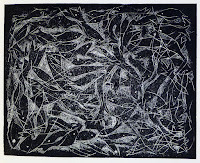 As for Eppink’s continued march through printmaking techniques, I have little interest in Planographic Processes (which is lithography), and although I suppose one could argue that monotypes are planographic, Eppink categorizes his under Miscellaneous Processes. 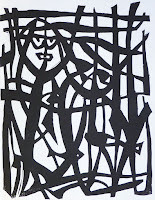 I don’t much care about Stencil Processes (which include stencils and serigraphy, the fancy word for silkscreen). And my prejudice is that Photography Processes aren’t printmaking at all but belong in a wholly different book! 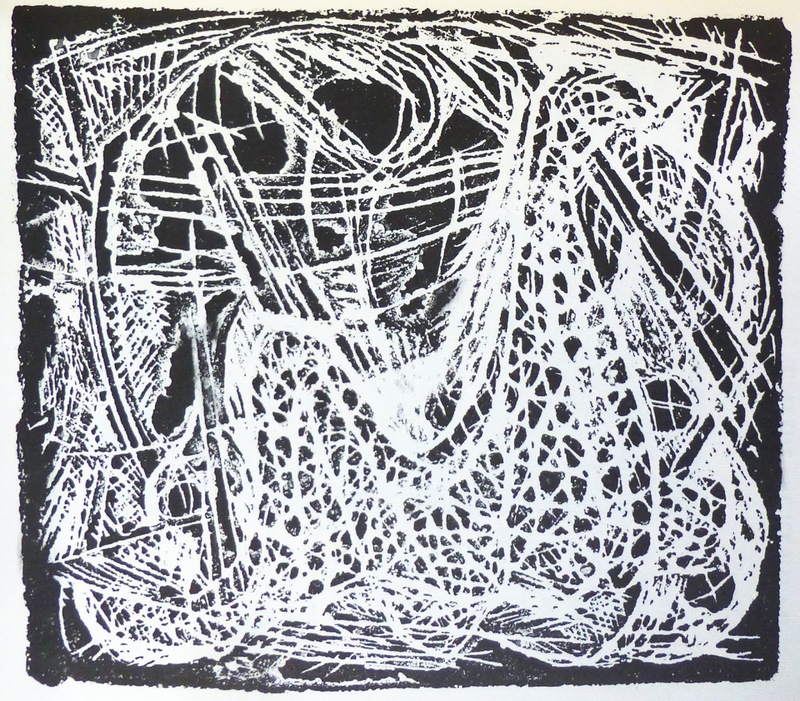 And that concludes Eppink’s review of “serious” printmaking… but tune in for the third and final installment, where things get wild and fun! 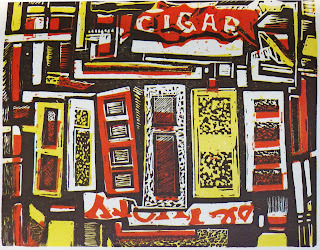 In 1967 Norman R. Eppink (USA) published his monumental work 101 Prints: The History and Techniques of Printmaking, which consisted of exactly that: 101 prints, each representing a different printmaking technique. 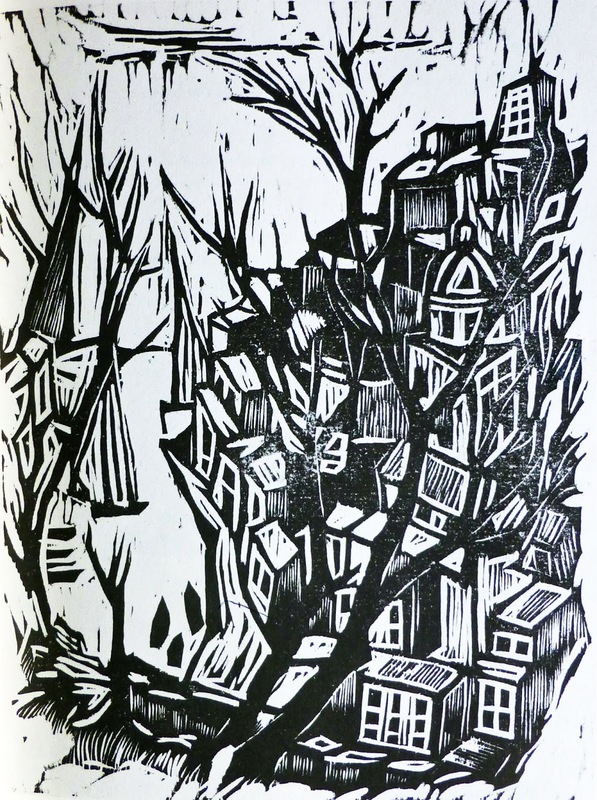 (In the limited 1967 edition, each of the representative prints was an original, and the book was printed by Eppink’s own press. 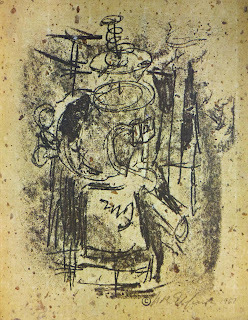 He then published a regular edition in 1971 with reproductions of the illustrations.) 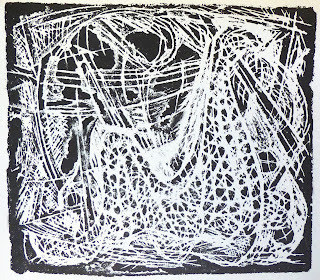 The book is epic in scale and represents a tremendous undertaking on Eppink’s part to research so many different printmaking techniques and master them all at least sufficiently to produce a representative sample. 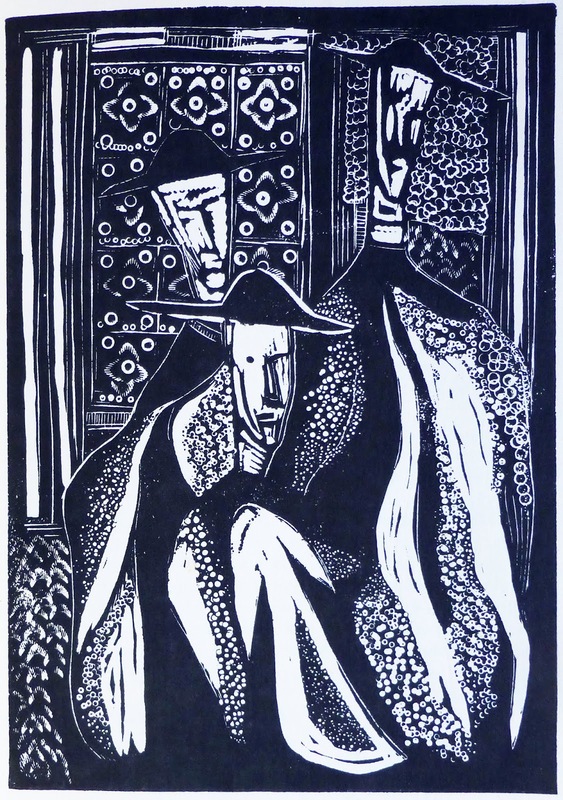 The only downside is that unfortunately I actually don’t like very many of his prints! Still, it’s a cool enough project that I want to share a bunch with you - so many, in fact, that I’ll divide them over multiple posts. 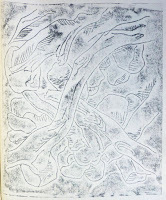 relief processes that Eppink includes in his collection, I have linked to some of my own posts for comparison. 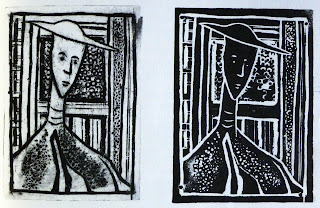 Eppink includes woodcut and wood engraving, linoleum cut, and then various multi-block, multi-color versions. He also includes more obscure blocks including casein, gesso, plaster, lucite, plexiglas, rubber (inner tube rubber, not purpose-made rubber carving blocks, which hadn’t been invented yet), celluloid dissolved in acetone, and my favorite for sheer randomness: rabbit-skin glue mixed with molasses. 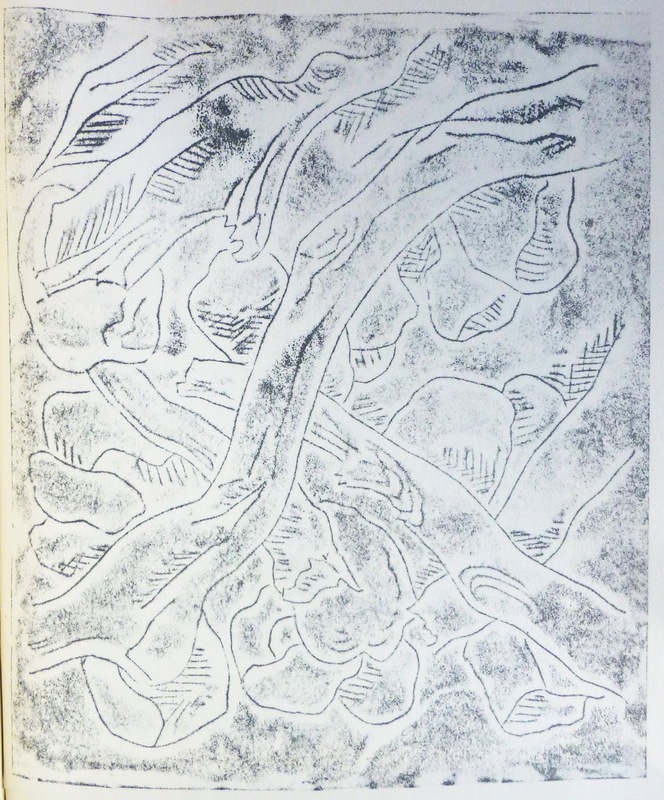 In other words, anything that can be made into a flat surface and carved can become a relief printing block. I’m not entirely sure why these particular materials were chosen for inclusion, but I gather that each of them had at least one “serious” artist working in that medium. 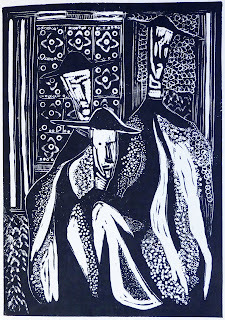 So I include for you today Eppink’s woodcut, wood engraving, linocut, and casein cut. Casein, in case you don’t know, is a protein from milk that has a long history of use in paints and glues (and cheese, but even Eppink doesn’t seem to have considered making cheesecuts). 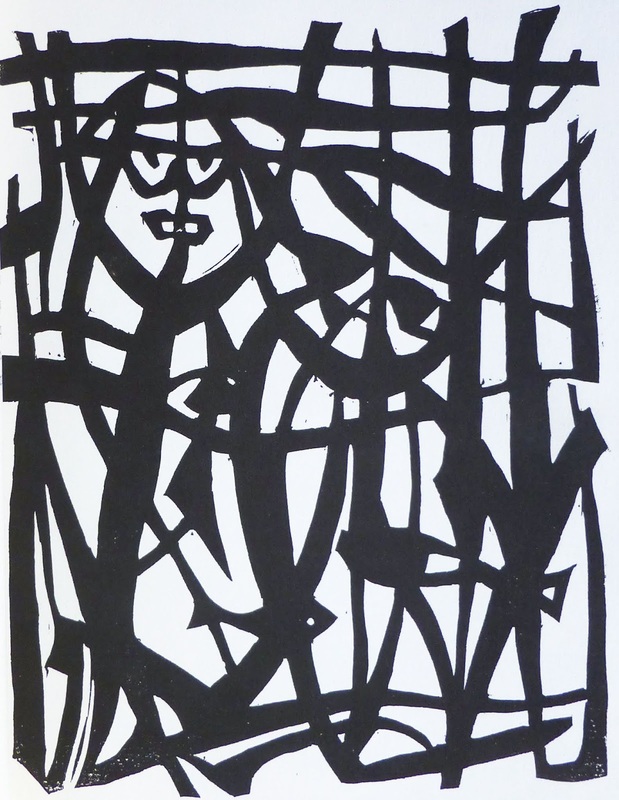 You can see that his casein cut is just a jumble of experimental mark-making, but what I don’t know is whether that’s about all a casein block is capable of, or whether Eppink just didn’t feel like doing anything else with it. After all, he still had 92 more prints to go. 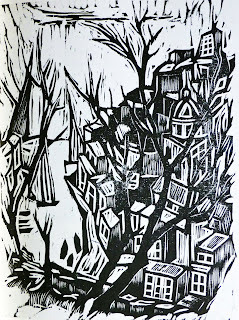 And finally, I’ve also included his 3-color linoleum block print, which is specifically three blocks, one for each color. understand it, they’re both just versions of the same acrylic plastic? It certainly makes me wonder how I would break down the various possibilities if I were to undertake such a project. But perhaps this blog is at least a partial answer to that question, even if it hasn’t been at all systematic. Up next, we’ll move into techniques that, despite being categorized by Eppink in sections other than Relief Processes, are still interesting. 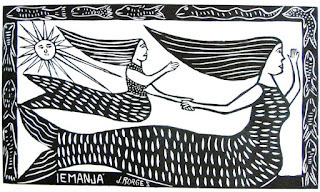 Today is World Oceans Day, and we already got the celebration started with some Odd Fish a couple weeks ago, so today I have something even odder: merpeople. 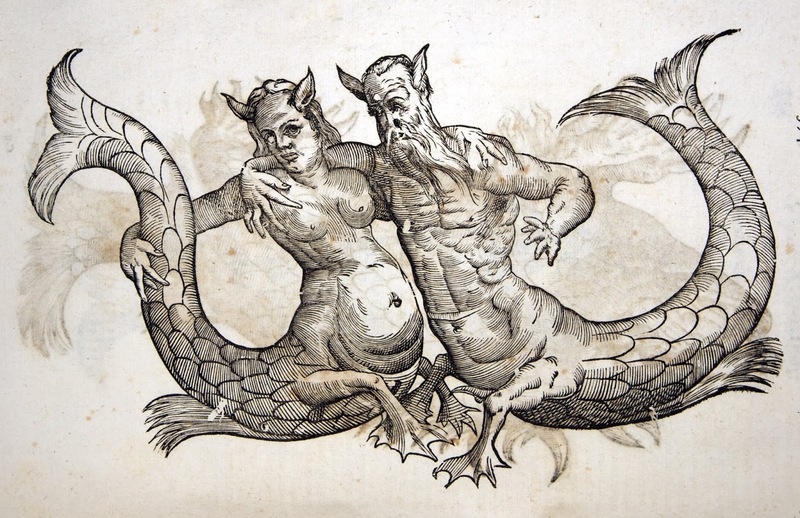 The biology of merfolk has always been a bit of a puzzle. How can a creature’s internal systems actually function if they’re half fish, half mammal, half cold-blooded, half warm-blooded, half water-breathing, half air-breathing? 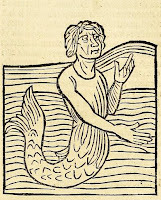 But leaving such considerations aside for the moment, the important thing about merfolk is that they are intelligent beings who live in the world’s oceans and are entitled to some opinions about the state of the seas and how humans have been treating the water for the past few centuries. Other intelligent sea creatures, such as dolphins and whales, of course, are also entitled to opinions, but presumably merfolk could actually tell us their opinions in clear and unambiguous speech. 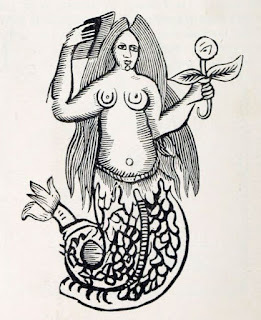 My first mermaid, combing her hair in the traditional manner, comes from “A Strange and Wonderful Relation of a Mermaid, that was seen and spoke with, on the Black Rock near Liverpool, by John Robinson Mariner, who was tossed on the Ocean for Six days and Nights; Together with the Conversation he had with her, and how he was preserved.” From this account I learn something I did not know about mermaids: it is vital that you speak first. As the account explains, “she appeared to him with a smiling Countenance and (by his Misfortune) she got the first word of him, so that he could not speak one Word, but was quite Dumb.” Perhaps this is why we haven’t heard the merpeople’s opinions yet: we always get the first word. Next up, a really unusual mercouple. They have large animal ears, for starters, and odd tufts on the undersides of their tails, but their strangest feature is the little web-footed legs. These legs seem to add amphibian to the mammal-fish mix. 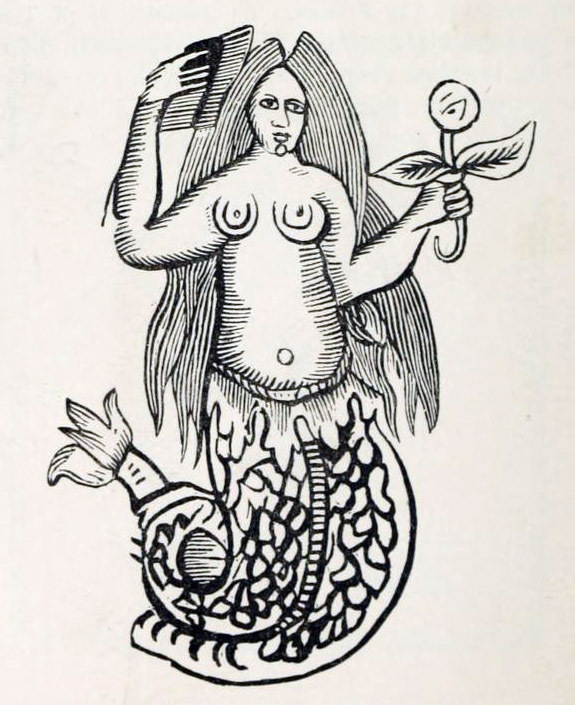 We know there must be many different species of merpeople, including an armless one here, and of course the double-tailed species made famous by Starbucks Coffee. It may be that these legged merfolk are seen more often than we realize, if their legs are underwater when sailors usually spot them only from the waist up. 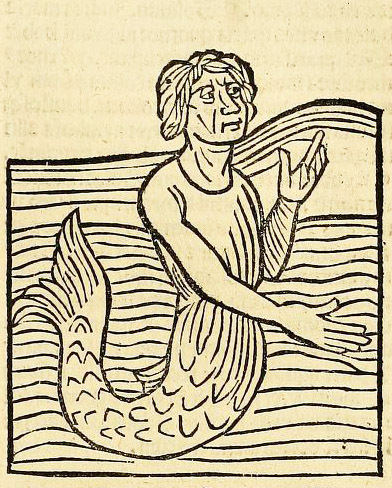 Mermen get a lot less representation these days, so I’ve included a fifteenth century mergentleman who strikes me as looking rather scholarly. I’d bet he could tell us a thing or two about plastic straws, helium balloons, oil spills, and the rest of the ocean trash. And finally a pair of mermaids wearing scales to the neck for modern notions of modesty. A mother-daughter pair, perhaps? Other than Andersen and Disney’s assurance that young merfolk go through a rebellious adolescent phase much like humans, we know very little about the life cycle of merpeople. That’s all the more reason to take care of our oceans before we lose the chance to learn more about the wonderful creatures that live there. 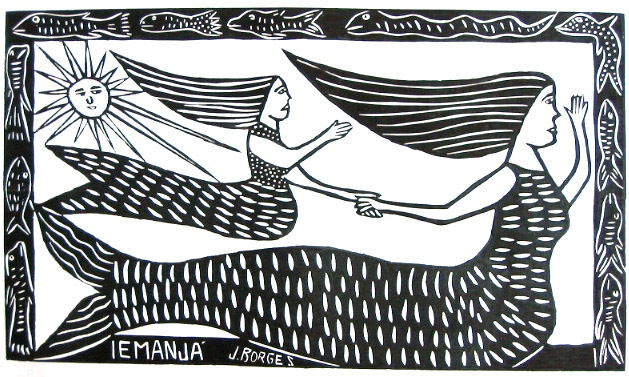 Okay, so maybe there aren’t mermaids living in the world’s oceans, so why have I picked them to celebrate World Ocean Day? Well, the truth is that we have absolutely no idea how many more strange and incredible species remain undiscovered in the seas, but we know there are large, intelligent, beautiful creatures already in danger, and there are almost certainly creatures at least as wondrous as mermaids that we’ll never know about if we don’t ease up our abuse of the Earth. So let’s Save the Mermaids and all their fellow sea creatures before it's too late. 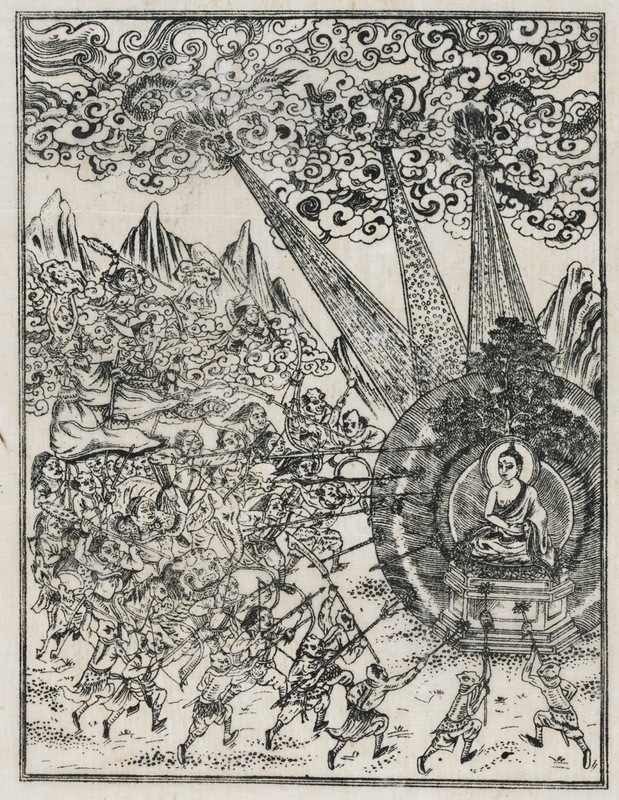 Here are two nineteenth century Tibetan Buddhist broadsides printed from wood blocks. 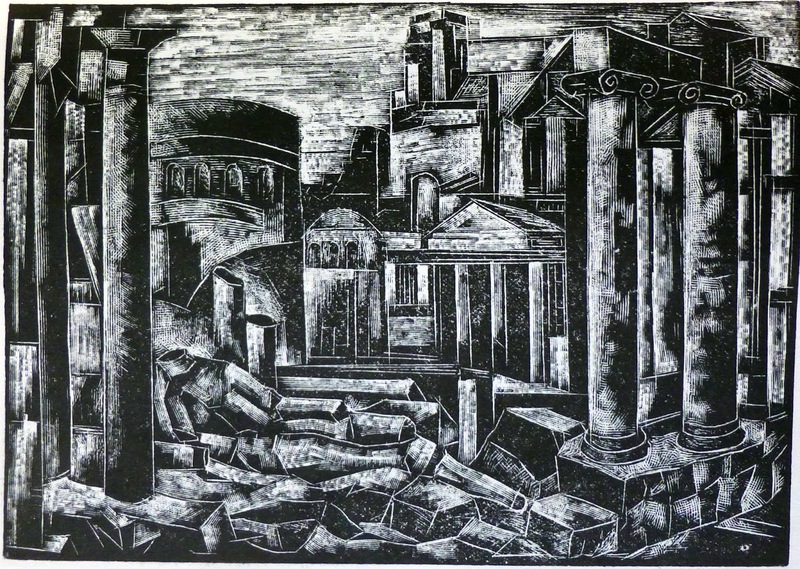 The first is a complex scene, and so detailed it almost looks more like an engraving. The tiny circles in the central light beam (if light beam it is) are the sort of thing that’s particularly fiddly to carve. 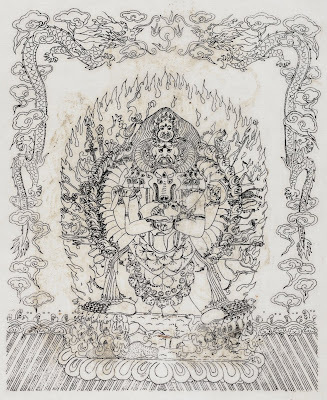 According to the description, this represents a wrathful manifestation of the bodhisattva Manjusri. I don’t know anything about the iconography of Tibetan Buddhism, so I can look at this only as an image in its own right. There are dragons in the clouds, shooting beams from their mouths, and an elephant and a lion among the attacking hordes. Maybe it’s because I recently reread The Lord of the Rings, but the figures in the lower right, particularly, make me think of orcs. 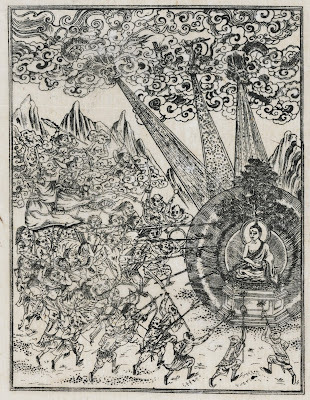 To me it looks as if the heads of the spears transform into flowers as they enter the aura of the bodhisattva. I have no idea whether this is what the artist intended to depict, but I love the idea! The second piece is somewhat simpler in style, just outlines, and arranged in a flatter, more schematic composition. It represents Gautama Buddha under assault by the forces of ignorance. I totally know how he feels. The forces of ignorance are led by the demon Mara, whom I take to be the buffalo-horned monster. Look at all those hands hemming the Buddha in with their clutching, busy demands, and the ranks of feet, their toes lined up like shark’s teeth. The left feet (his left) stand upon a row of birds, and the right feet on a row of something that look to me like reptilian camels, but I’m guessing perhaps nagas? The border of dragons and clouds is quite lovely. 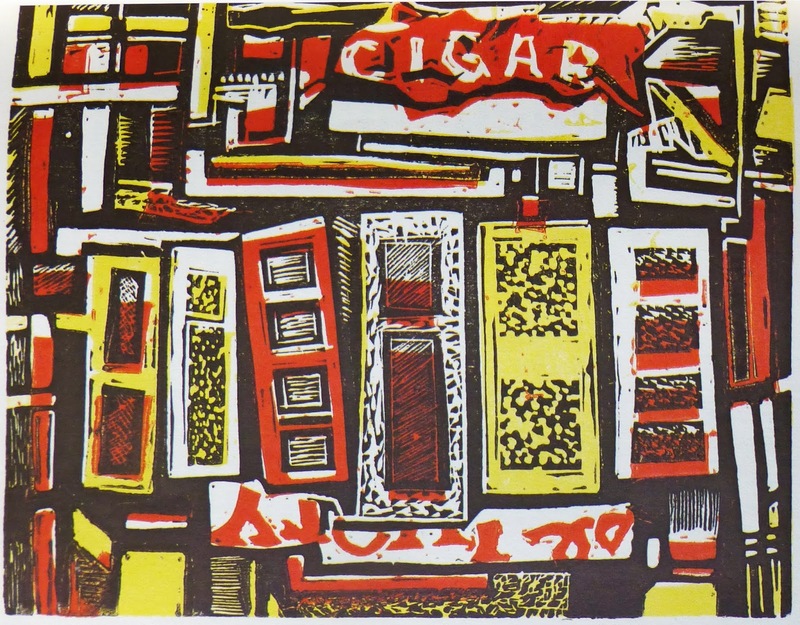 Wood block printing has, of course, been used for centuries all around the world for a wide variety of purposes. I don’t know to what extent the anonymous artists who made these images thought of their own work as Art, and to what extent they thought of it more as graphic design, or even just recopying a standard iconography. In any case, they are new to me, and I found it interesting to see one more different style of relief block printmaking. It's Not Fantasy. It's Preparation. - How, indeed, the division between children’s and adult’s literature is somewhat artificial anyway. Go read the entire article here: How Children’s Literature Became Everybody’s Literature.